Shih Tzu's are super energetic furballs that love to run and play all day long, but with all that playing comes those dreaded tangles. Their long coats are a magnet for dirt, mats, and stains and certainly give us dog groomers some daily challenges. Thankfully, grooming these little critters everyday has taught me a few tricks about keeping them well clear of uncomfortable mats. The key is having the right tools so you can avoid expensive grooms, shave downs, and painful tangles while maintaining that beautiful coat. ​The A5III is a more affordable version of our #1 pick, but missing a few features. The pins are not as flexible and ​more prone to causing brush burn. ​This is optional but incredibly helpful. 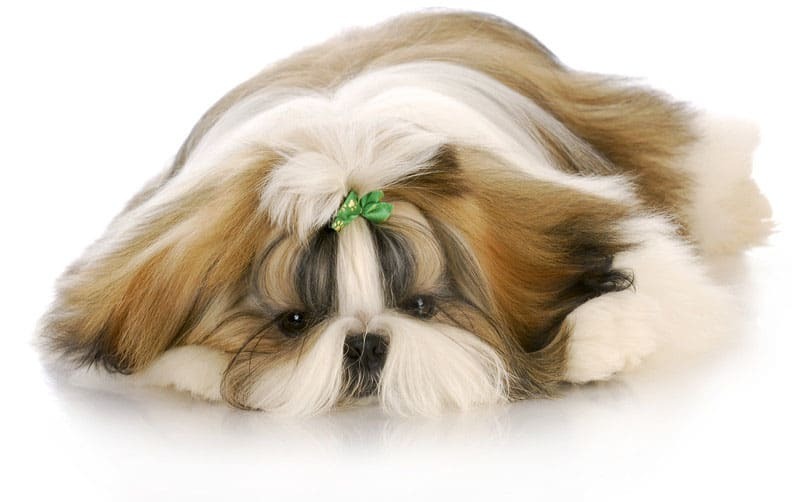 Shih Tzu hair is prone to dry ends, which then frizz and grip onto each other creating a nest of mats. A good conditioner is a life saver. A few tangles or mats can always be brushed out, and dog's with little or no matting makes my job as a groomer an absolute joy (not to mention a cheaper groom for you). However, heavy matting that's right down to the skin not only makes grooming difficult, it is extremely painful for your dog. As time goes on tangles get tighter and tighter, pulling on the skin causing severe bruising and sometimes breaking the skin. 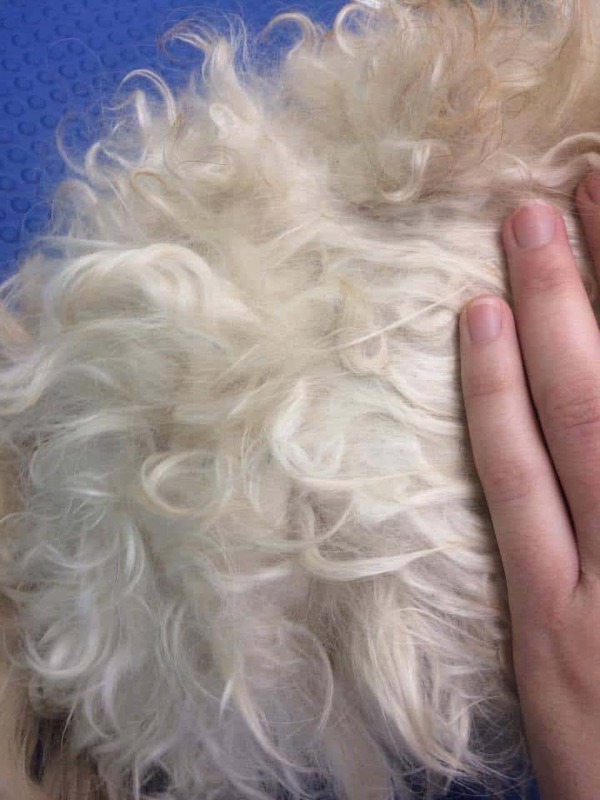 ​This is why it's not always possible to brush out a heavily matted dog, and the only humane option is to shave them down completely. The most common place for tangles to occur are friction areas. What we mean is anywhere that hair rubs constantly as your dog runs and plays, the hair grips onto itself like velcro and rolls and tangles. This is usually in the armpits, groin area, and around their collar - so whenever brushing your dog out, please pay special attention to these hidden spots. 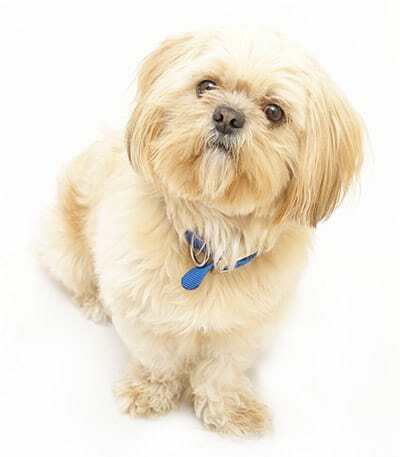 Shih Tzu's are prone to dry ends, which create little hair burrs that frizz and grip onto each other. Their coat can be a perfect storm of mats just due to genetics! The simple solution is just using a moisturizing conditioner once a month to keep hair smooth and keeping frizz to a minimum, while also brushing a few times a week. Every time your Shih Tzu goes for a swim or bath - you should brush them out while they're still damp. What tends to happen is their natural curls will expand, grip onto each other, and then tighten as it dries, wreaking havoc on that beautiful coat. Another very important note: After bathing you absolutely must rinse their coat thoroughly. Shampoo and conditioner that hasn't been rinsed out will clump at that hair root, causing some very difficult tangles. I always follow this 2-point inspection with every Shih Tzu that comes into my shop, and it's something you can easily do at home. 1. Is there heavy matting behind the ears, on the front of the legs, or in their armpits? These are very sensitive areas, and brushing out mats can cause some severe discomfort. 2. Can you separate the hairs to see skin? If they have mats in these areas, or you can't see skin, then you'll likely have to shave them completely and start over. I know many owners hate doing this, but as groomers and dog owners we have to consider the comfort of your dog first. Matted Dog - I'm unable to separate the hair to see the skin underneath. ​So how do we prevent matting and shave downs? It comes down to proper bathing and brushing, but not just brushing surface hair... You need to get right down deep into their coat, and brush down to the skin (without causing irritation) to remove those hidden tangles. We need pins that don't just comb, but separate individual hairs as it works through the entire coat. And we groomers have the perfect tools for that. Another factor that comes into play is proper nutrition and reducing stress. Up to 30% of your dog's daily protein requirement is used to grow and maintain hair follicles, meaning a poor diet can lead to dry and unhealthy hair. Understanding the nutritional requirements of your Shih Tzu and ensuring they receive a proper balanced diet can make a massive difference in their coat, not to mention it keeps them healthy and happy. 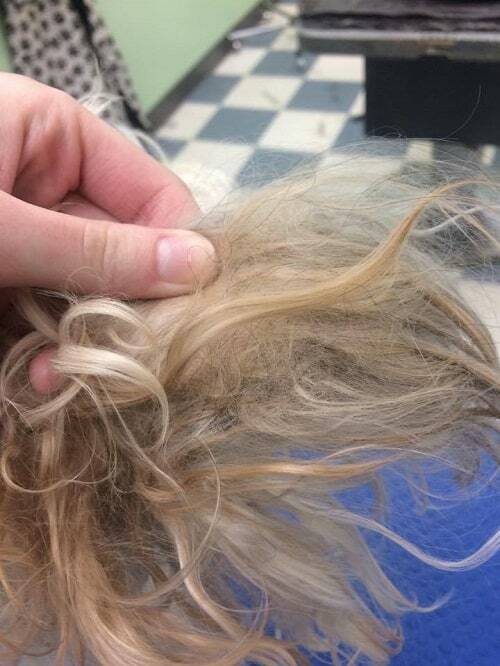 ​​I have frustrated Shih Tzu owners come into my shop everyday who absolutely had the best intentions of keeping their pup free of tangles, only to be told they're STILL full of mats. So what happened? If you're brushing everyday then why is there still tangles? It honestly comes down to picking the right tools so you can get down deep enough. This is the number #1 thing I recommend to owners, because if you're still using that cheap pin brush from the dollar store you're in for some difficult grooming sessions. 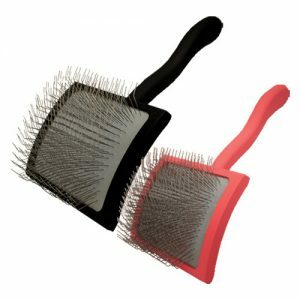 A good quality slicker brush is dense with hundreds of pins that separates the individual hairs as it brushes, and is designed to make grooming comfortable and enjoyable. Your Shih Tzu has very sensitive skin underneath that coat. A good brush will have flexible pins which bend back to release pressure in order to avoid skin irritation, and each pin surface will be smoothed to avoid causing pain. When you're holding a brush for hours like I do, a comfortable handle makes a BIG difference. And it shouldn't break when it's inevitably dropped once or even a dozen times. I know it's tempting to just go for the cheaper version, but it's better to just get the good brush. Why? Because the cheap brush has sharp pins that do not bend and will hurt your dog's skin, the pins will wear out and break, the handle will break, and it just won't be as efficient. You'll actually save money just buying one good brush you can use forever over a dozen cheap ones. Make sure you dog is 100% mat free with a simple and very cheap tool. In comes the Greyhound Comb to save the day. Gently glide through their coat to "seek and destroy" any of those hidden mats the slicker couldn't quite reach. 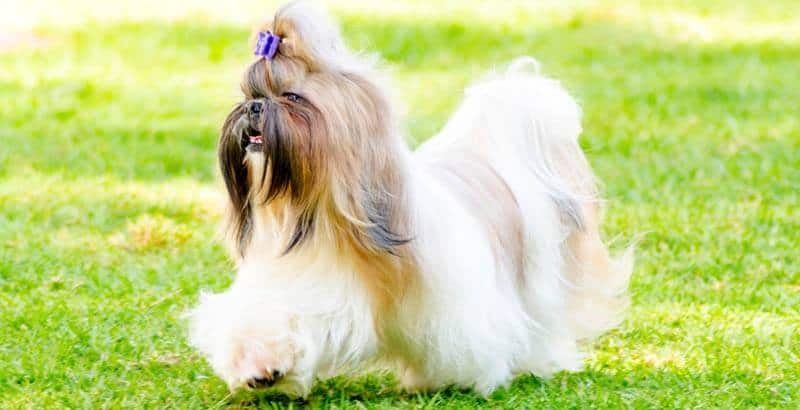 ​Here's my process for every Shih Tzu that visits me in my shop, and how I recommend you maintain your dog's beautiful coat. 1. If your dog is matted, try giving them a bath first, use a fair amount of detangling pet conditioner and let it work it's magic for several minutes before rinsing. Towel dry the dog (but leave them slightly damp). Now that those tangles are a little looser, brushing them out will be easier. 2. At least twice a week - use a good slicker brush and gently brush through their entire coat. Do not go over the same spot more than 3 times (unless you have a slicker with bendable pins) as you may irritate their skin and cause brush burn. 3. Always brush with the growth of hair (not against it), be very gentle around sensitive areas such as the armpits or behind the ears. 4. Pay special attention to friction areas such as around their neck (if they wear a collar) and armpits, these tend to have the most mats. Always remove their collar before brushing. 5. Now use a greyhound comb and glide through their coat, looking for any mats you may have missed, especially those deep tangles closer to the skin. 6. If you bathed them prior - use a dryer on cool (while gently combing) to blow out any remaining coat and dry before those curls contract and create more mats. ​I groom everything from show dogs to rescue dogs, and these are the exact tools me, and everyone who works in my shop uses. 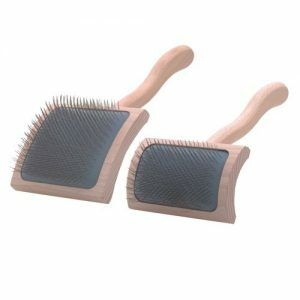 A good slicker brush will make brushing easy, and comfortable for your dog. The fine bristles will penetrate into their coat and detangle most of the surface hair, while removing dirt, and debris. The #1 issue with nearly all the brushes on the market is brush burn. While you brush through their coat the sharp pins will irritate your dog's sensitive skin. So you'll need a brush that is designed to make grooming as comfortable as possible. Also, you want a brush that's dense with pins, so that each pin spreads hair apart and easily dematts as you brush. So here I've listed the best slicker brushes that are designed to avoid brush burn, and maximize dematting. ​This ​slicker is considered the absolute best by every groomer I've met (including me). The cost may deter you, especially when other slicker brushes are so much cheaper, but every part of this ​tool is ​engineered to make grooming comfortable for your ​pup. I ​have been using my Chris Christensen slicker on every single dog in my shop for 3+ years without worrying about brush burn, and it's a miracle de-matting tool. ​Very dense with Pins, used for separating hairs and making dematting easier. ​​You pay for quality, so it's certainly more expensive than a typical dog brush. That being said, it's the best brush on the market, and the last one you'll ever buy. ​​This is a less expensive version of the my first pick, with a few less features. Mainly there's less pin density and it's not as flexible, but still a very good slicker brush. You'll have to be aware of brush burn and ensure you don't go over the same spot more than 3 times. ​​More affordable version of my first pick. ​Good pin density, used for separating hairs and making dematting easier. ​Pin density is slightly lower, but still good. ​Pins don't bend as much, which may lead to brush burn. Do not brush any part of your dog more than 3 times. I call this my "seek and destroy" tool, I glide through their coat with the long pinned greyhound comb to find any hidden mats. It's perfect for finishing your dog and making sure they're 100% clear and free of tangles. 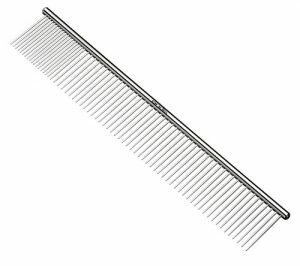 ​​There are a million replicas of this exact comb, but I prefer using Andis because the pins are stronger and ​the tips are softened to avoid hurting your dog. The long pins reach deep into their coat, unhinging any hidden tangles near the surface of the skin. While a very handy little tool to have in your grooming arsenal, it's not necessary if you keep your dog's coat fairly short. ​But it's an absolute must-​have for grooming thick or long coats. ​Long comb for removing deep mats and debris. ​Quick tool for finishing touches. ​​​​​These break down over time, and comb needles get bent. Thankfully, it's cheap to replace. Finally, you can use some detangling shampoos and conditioners to assist you in your dematting. They do make a big difference, especially for those dogs who love to roll around and play (which is pretty much every Shih Tzu). Please keep in mind that you must dilute this product 32 to 1. 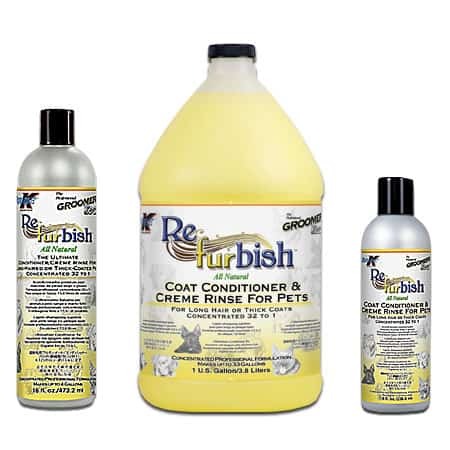 ​Fantastic for moisturizing Shih Tzu's naturally dry hair and skin. ​​Loosens mats and prevents further mats from developing. ​Concentrated 32 to 1, so you actually get a lot out of a single bottle. ​​Will help with minor to moderately matted dogs, but not heavy duty matting. OMG i learned so much. Very helpful!